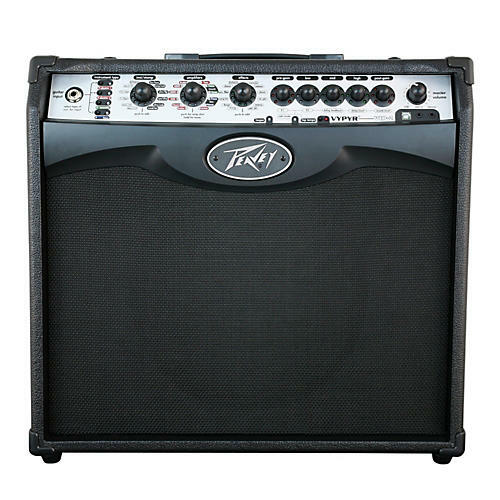 The Peavey VYPYR VIP 2 guitar modeling combo amp uses Variable Instrument Input technology to provide 40W of amplification for a variety of instrument types. It allows electric guitar players access to instrument models as wellPeavey uses a combination of 32-bit, floating point SHARC processors and TransTube analog circuitry to create one of the best sounding modeling amps available. The VYPYR effects can be accessed without plugging into a computer, unlike many other modeling amps. The new USB bi-directional data and audio port provides an easy way to record, connect to VYPYR software, store presets, get lessons and practice to backing tracks. All the revolutionary features from the original VYPYR series, plus more power, effects, amp models, instrument models and other killer upgrades.